Green flooring concerns include the nature of the material used, the installation application, cleaning considerations, the effect it has on the interior environment, and its ability to be reused, recycled, or reincorporated into the environment at the end of its life cycle. Linoleum flooring excels in all of these areas, making it one of the greenest flooring choices that you can make. Warning: Many retailers are still calling Vinyl tiles “Linoleum.” This term has been interchangeable for years, but it is blatantly false. Linoleum is made from natural materials, while Vinyl is a synthetic mix of chlorinated petrochemicals that has several environmental concerns that are not shared with Linoleum. All of the materials used in the manufacture of linoleum flooring tiles are biodegradable, all natural, and easily renewable. Solidified Linseed Oil: A clear to yellowish oil obtained by dry pressing flax seeds. Historically it has been used for illumination and cooking. This is combined with Tall Oil which is a recycled, post-industrial material, which helps optimize the oxidation of the Linseed Oil. Ground Cork Dust: A highly renewable material taken from the bark of the cork tree which regrows its bark every ten years, making this a highly renewable resource. This material is ground into a fine powder. Wood Flour: A powder made from natural ground hardwood. This gives the finished linoleum a more vibrant colorfast appearance by binding the added pigments to the mixture. Its presence also helps to give Linoleum a smooth texture by optimizing the surface of the material. Rosin: A resin that is tapped from the trunk of pine trees, causing them no damage. This natural substance is added to give the linoleum flexibility and strength. Limestone: A natural stone material which is quarried from the earth and ground down into a powder before being added. Pigments: Eco-friendly pigments containing no heavy metals can be added to Linoleum in a variety of ways to create numerous colors and patterns. Adhesive: With most sheet and some tile and plank Linoleum flooring installations you will have to use an adhesive to adhere the material to the subfloor. Make sure that you use a non-toxic adhesive that is solvent free, and meets all low VOC requirements. Apply in a well-ventilated area, and follow all manufacturer instructions. Floating Floor: Linoleum tiles are available in click together tongue and groove floating floor designs. These install with no adhesive and so do not have any impact on the interior environment. 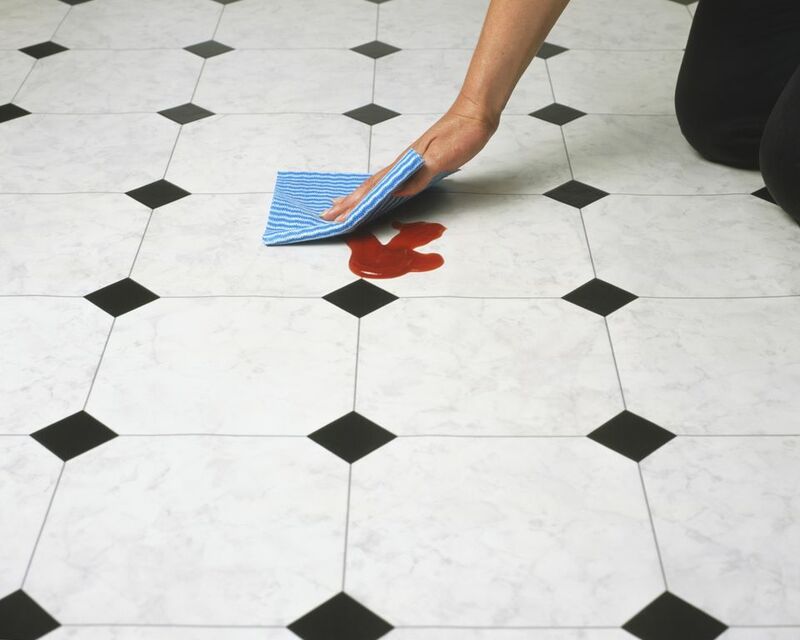 After installation, an environmentally friendly acrylic sealer should be applied to the surface of the floor at least twice, and then renewed annually to protect the integrity of the tiles. Due to the antimicrobial nature of these floors disinfectants are rarely if ever necessary in cleaning and maintenance. A well-maintained application of Linoleum can last for forty years, and many older buildings still have beautiful and vibrant Linoleum floors in use today. Linoleum is colorfast so that even as it naturally wears down over time the hue found on the surface of the floor does not fade. At the end of a linoleum floors life, there are two options for reintegrating the materials into the environment. Fuel: Linoleum can be incinerated to produce a relatively clean source of energy which is comparable in strength to the same amount of coal being used. The Carbon Dioxide which is released during the process is equivalent to that which is consumed by the various organic materials which it is manufactured from. The amount of energy created also equals roughly the amount expended in the production of the Linoleum, making the entire process a closed-loop system. Biodegradable: If you place Linoleum in a landfill, it will decompose over time without releasing harmful gasses or toxins into the air. The natural, biodegradable materials used in the manufacture of the product will reintegrate with the earth. Aside from transport, this process requires no energy consumption.